This comprises a translation of 2 short texts – one on the recent revolts in Guandong, the other about resistance to nuclear power, followed by a list of some of this year’s events. To understand anything about the latest riots in the village of Wukan, you must first understand what the characteristics of land tenure in mainland China are, characterised by the absence of private ownership of land. In essence, it is still based on two forms of ownership, established at the time of the formation of the Maoist state. The first is based on state property. Only the central government can dispose of it. The second is based on collective property. Local authorities can manage them within the areas under their control, the villages forming local bases of the statist pyramid whose summit is based in Beijing. In other words, land is no more commodified than it was in the days of Mao. Nobody can sell or buy it. On the other hand, depending on the extent of their respective powers, the authorities may authorize its use and distribution. In principle, unless authorised by the central government, the authorities in rural areas cannot expel farmers unless they, due to poverty, cannot develop the plots they lease them. However, with the accelerated expansion of market relations in the countryside, such poverty happens increasingly in huge proportions. In coastal villages like Wukan, in the past it was not so much the case, at least not to the same extent as today. 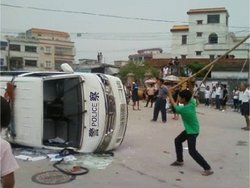 The extensive riots of 2011 broke out precisely because the mayor of Wukan, and his associates, with the aim of renting out the fertile and more or less valuable communal land to developers, tried to drive out the villagers, unleashing their particularly brutal militia against them. 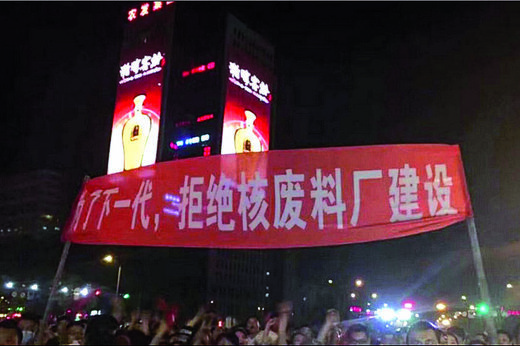 That’s why, in Wukan, as indeed in a lot of other villages in China, they brandished the banner of the fight against corruption as well as the red flag, a symbol of the collective ownership of land in their eyes – an illusion in my opinion – as their last line of defence. In 2011, given that the situation was becoming increasingly tense throughout the whole of Guangdong Province, the birthplace of “market socialism, and that the fierce resistance of Wukan was turning into a symbol, Beijing put pressure on Canton, the seat of the provincial government, to freeze land transactions, remove the mayor, to imprison and torture him, as well as members of his clan, in the special prison in the provincial capital reserved for corrupt local cadres, and to speed up the organization of municipal elections, scheduled by the 1987 law (!) which allowed those who had no party political affiliation to access municipal functions, including that of mayor. So it was Lin Zuluan, who had been appointed by the villagers to negotiate with Canton, presented by our democrats as “the leader of the revolt,” who ascended to the post and tried, from there, to domesticate the goat and the cabbage. Dalian, in the province of Liaoning, third largest port in China, on the Korean Bay. In ten years, the region suffered two oil spills. In 2011, massive riots led Beijing to abandon the idea of installing the largest petrochemical plant in the country. After hardly two decades, the devastating effects of the rapid industrialisation of China on the population’s health have been enormous, particularly those due to the proliferation of deadly petrochemical sites. These ravages are one of the causes of the revolts which increasingly upset the “harmony” of the country’s “market socialism”. To understand the meaning of these revolts, one must first understand that the key sectors of the economy, primarily nuclear, remain state property or the property of joint enterprises under the control of the state. Thus, the China National Nuclear Corporation (CNNC) essentially owns and manages the electro-nuclear power industry in China. This means that important decisions are made, in the final analysis, by the central government in Beijing – despite being the object of innumerable, more or less mafia-like, negotiations with local authorities, who don’t want to play the role of scapegoat in case of failure. Up until recently, the petrochemical industry was the main target of opposition to the general poisoning caused by industrialisation. Massive and sometimes radical, this opposition has already led the state to suspend the implementation of construction projects intended for selected priority sites and has sought to install them elsewhere, which is not always possible. But from now on it’s the turn of nuclear power to be targeted. In 2012, the first warning shot was fired at Pengze on the Yangtze River in central China. It’s true that the building of the nuclear plant over the running water has been brought to a standstill since then for two different reasons: the concern of local residents, especially farmers, and the refusal of the provincial government of Jiangxi to bear the main burden of construction costs. But there is more. Since 2013, the realisation of two massive monumental projects as part of the State’s plans, which are as dangerous as the power stations, has been hampered by the insubordination of the potential victims of radiation. The first project concerns the preparation of the basis of nuclear fuel – enriched uranium; the second concerns the treatment and storage of nuclear materials created by the fission of uranium in reactors, starting with the highly valued plutonium. To the extent that the state intends to consolidate its position as a major world power in the nuclear field, military as well as civil, the realisation of such sites is crucial for the future of “market socialism”. Jiangmen, in Guangdong Province. The first day of protest in 2013 against the project of a uranium enrichment plant. The second project has just been reversed, during the summer of 2016 – the one concerning the processing and storage of fission material. Modelled on the plant at La Hague in France, the consortium formed by Areva and CNNC have committed themselves to realising it. The Town Hall council of the coastal city of Lianyungang, located in the Yellow Sea in Jiangsu province, was in the process of proposing the town’s candidacy to the consortium when the news filtered through. Which was enough to spark things off. It must be said that the region is already severely nuclearised. The reputation of the two reactors at the power station in Tianwan, thirty kilometers from the city center, is particularly appalling. In a few years, the site will include six additional reactors. Two are already under construction, making it one of the largest nuclear facilities in the world. 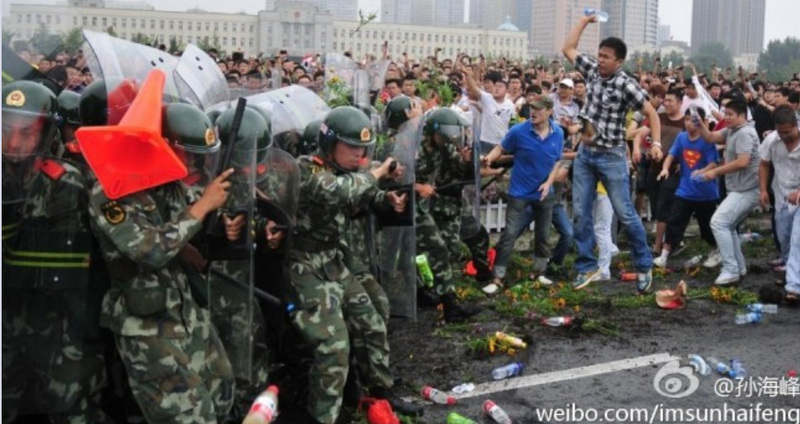 That’s why this summer demonstrations, involving tens of thousands of residents of the prefecture of Lianyungang, have started – the demonstrations becoming increasingly violent since police killed two people. What’s more, sporadic strikes took place in the port area to protest against police brutality. Although, sometimes, the national anthem was sung, the slogans thrown up and adopted by the demonstrators left no doubt about their anger and determination. 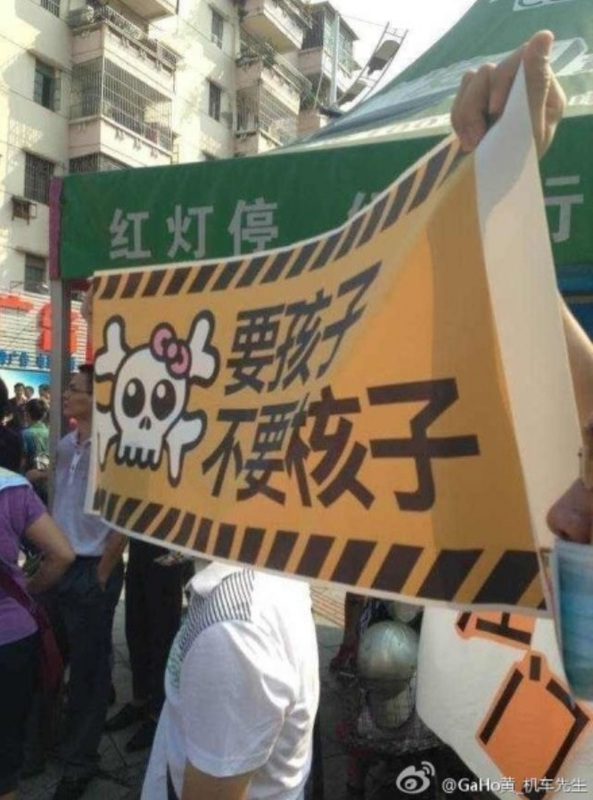 To cite the most repeated: “We love our Lianyungang – no nuclear dustbins!”, “Let’s protect ourselves from nuclear power!”, “Let’s protect the next generation “, ” Let’s not forget Fukushima ” and ” Don’t forget Tokaimura”. Tokaimura is the Japanese site for the preparation of nuclear fuel where, in 1999, uncontrolled chain reactions started, covering the surrounding areas with radiation. In short, for fear that the situation in the prefecture of Lianyungang would become explosive, the local authorities, with the backing of Beijing, decided to withdraw their application. But since then, they have been trying get dockworkers and other employees of enterprises dependent on the State, to sign papers in which they promise not to participate in activities or meetings hostile to nuclear power. Under the threat of losing their jobs. This shows that the previously mentioned hostility can’t bew reduced to the environmentalism which the new middle classes in China sometimes show, those who otherwise are more or less subservient to the Party. The revolt against the “lethal nuclear zones” has already gone beyond the limited framework defined by the members of environmental NGOs, who are often persecuted, beaten, kidnapped and imprisoned by the police. Yet their leaders, still tolerated in Hong Kong, claim they share the spirit of the laws enacted by Beijing against polluters. These laws seek only to sacrifice a few hated scapegoats accused of corruption. In the case of Jiangmen, these self-appointed leaders had advised the protesters to remain “peaceful” and not to “provoke” the Party. Following, in a sense, the Confucian precept that the meek shall, with the respect due to authority, present their petitions on their knees. But those who are primarily concerned have clearly decided to carry on regardless. Beyond the interesting information it provides on strikes in rural areas, this article about the district of Yangshuo, Guangxi, should, however, be subject to some clarifications. Because it implicitly accepts, in passing, the widely believed, hardly ever criticised, myth arising from the foundation of the Republican state in China, dating back to the 1911 revolution, attributed to Sun Yixian (Sun Yat-sen in Cantonese), and adopted by Mao Zedong. A myth that the basis of “Chinese civilization” has, for thousands of years, been driven by the Han, “the ultra-majority ethnic group,” surrounded by multitudes of “ethnic minorities”, to which the current state, in the “best case scenario”, confers local cultural and administrative autonomy. However, Jean-François Billeter, one of the few critical Sinologists today, like Simon Leys was in the past, said: “In the historical sources, which were almost all written by Confucian literati, ie by empire officials, the Chinese people appear not in their true diversity, but as a population subject to the emperor. This state was enough to define it. Revolutionaries, at the dawn of the twentieth century have transformed this administrative definition into an ethnic or racial definition. They needed a Han people as the foundation of their nationalism. The socialist system completed this idea by extending it to the national minorities. Ethnology could be of some service in the study of these “ethnic groups” because they were non-Han and “backward” but there was no question that it be used for studying the Han, a “revolutionary” people whose unity should never be the object of suspicion. That’s why researchers who nowadays go to the countryside sometimes feel like they’re discovering unknown continents.”– Jean-François Billeter, « Chine trois fois muette » (“China three times dumb”), Edition Allia, 2000. I recall that on Chinese identity cards, it indicated which “ethnic group” Chinese citizens are supposed to belong to. But there is no more an ethnic Chinese Han group than there is a Capetian ethnicity in France, a Tudor ethnicity in England, etc. The Han were there for over two thousand years, having succeeded the short-lived imperial dynasty, the Qin. 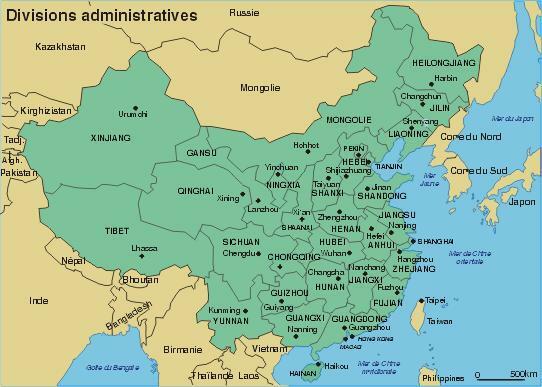 The fame of the Han is because they consolidated and extended the centralizing statist process put in place by the Qin, in particular by crushing the great feudal families and not hesitating to place commoners throughout all the levels of the massive “celestial bureaucracy” being established. They even went on to nationalise the ground! To return to Guangxi, I travelled there over twenty years ago, at the time when tourism was still limited. The reality of the local “unknown continent” was far removed from its official representation. The province, with 50 million inhabitants, has the status of an autonomous region – even its official name is the Autonomous Region of Guangxi Zhang. For although the Han officially constitute the “majority” (30 million), the Zhang constitute up to 15 million, the “majority” of the “minorities” in the province – the Yao, Dong, etc. Having moved around the region, I was, within the terms of specific local conditions, faced with customs, rituals, religions, more precisely with various pragmatic and more or less syncretic mixtures that did not match up with official classifications. I even met, not far from Yangshuo, a retired teacher who, to my question about his “ethnic” origin, had replied, like Woody Allen, “I am zhang when it suits me!” As with those Chinese who are more critical than the average, he did not believe in the founding myths of the national state, the creator of “market socialism “.